Salak Fruit are native to Indonesia and Malaysia and can be found growing in Bali, Thailand and India. The name Salak means ‘bark’ in its native regions. The popular fruit is sold in farmer’s markets throughout Southeast Asia. The fruit are used to help poor eyesight and treat digestive maladies. Salak Fruit have a shape similar to that of a fig. Salak Fruit has a scaly outer skin that is sometimes covered in tiny spikes. Salak Fruit purchased in markets is typically smoothed. Most varieties of Salak Fruit have dark brown skin when mature and have a bulbous appearance that tapers to a point at one end. Beneath its scaly skin lies three white to yellowish colored lobes that look similar to large cloves of peeled garlic. Each lobe contains a hard brown, inedible seed. The texture of Salak fruit is similar to that of garlic, crunchy and crisp. The flavor is tropical, with hints of pineapple with a slightly acidic taste. Some varieties are drier and have a flaky consistency while some Salak Fruit are moist and juicy. Some say Salak fruit is an acquired taste. Salak Fruit is harvested and sold year-round in Southeast Asia. The Salak Fruit, also known as Snake fruit in Malaysia and Indonesia, is a fruit in the Arecaceae or palm family. The small fruit is wildly popular in Bali and India, just as apples and oranges are in the US, yet it is rarely seen outside of its native region. 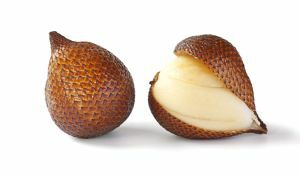 Salak Fruit is also known as Salacca Fruit, after its botanical name ‘Salacca Zalacca’, and has over 30 known varieties. Salak Fruit is called the Fruit of Memory in Indonesia due to its levels of potassium and pectin. It contains nutrients like thiamine, iron and calcium as well as vitamin C. The Indonesian fruit has anti-diarrheal properties; if too many Snake fruit are consumed it can result in constipation. 1. It is used to treat defecate steadily. 3. It is mainly used to treat eye diseases due to the presence of Beta-carotene content. 4. Salak fruit contain nutrients such as Protein, Carbohydrates, Dietary fiber, Calcium, Phosphorus, Iron, Carotene, and Thiamine that are good for body health. Recipe using Salak fruit see Here.